222 pages | 14 B/W Illus. This book makes a significant contribution to the history of placemaking, presenting grassroots to top-down practices and socially engaged, situated artistic practices and artsled spatial inquiry that go beyond instrumentalising the arts for development. 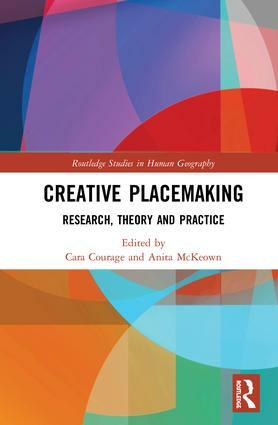 The book brings together a range of scholars to critique and deconstruct the notion of creative placemaking, presenting diverse case studies from researcher, practitioner, funder and policymaker perspectives from across the globe. It opens with the creators of the 2010 White Paper that named and defined creative placemaking, Ann Markusen and Anne Gadwa Nicodemus, who offer a cortically reflexive narrative on the founding of the sector and its development. This book looks at vernacular creativity in place, a topic continued through the book with its focus on the practitioner and community-placed projects. It closes with a consideration of aesthetics, metrics and, from the editors, a consideration of the next ten years for the sector. If creative placemaking is to contribute to places-in-the-making and encourage citizenled agency, new conceptual frameworks and practical methodologies are required. This book joins theorists and practitioners in dialogue, advocating for transdisciplinary, resilient processes. Cara Courage is an arts and placemaking academic and practitioner and is Head of Tate Exchange, Tate’s programme and spaces dedicated to socially engaged art and the role of art in society. Her book, Arts in Place: The Arts, the Urban and Social Practice (2017), presents case-study research on social practice placemaking. Cara has also completed a project as Research Adjunct on the metrics of creative placemaking with Thriving Cities, an initiative of University of Virginia’s Institute for Advanced Studies in Culture, and continues her own social practice arts in place projects. Anita McKeown is an interdisciplinary artist, curator and researcher working in creative placemaking, Open Source Culture/Technology and STEAM (science, technology, engineering, arts and mathematics) education. Anita works for Art Services Unincorporated (ASU), an itinerant strategic platform which co-creates local-scale interventions that are context-responsive and ecologically sensitive, arising from extended relationships with people and place. ASU’s interventions are underpinned by the permacultural resilience framework and practical toolkit, a critical praxis for Creative Placemaking, trialled in London, Dublin and New Mexico (2008–15). Anita’s current research includes codesres: Co-designing for resilience in rural development through peer-to-peer networks and STEAM.